This group expands its business by recreating childhood bliss from cold treats. Masatami Shave Ice not just looks delightful; it is also promising as a franchised business opportunity. When Michelle C. Co traveled to Hawaii in mid-2011 and had a taste of shave ice, a rush of wonderful childhood memories came back to her. “The cool dessert reminded me of snow cones, but this one had ice shaved so fine that it instantly melted in my mouth,” she recalls. It was the same experience she wanted to share when she introduced the concept back home. 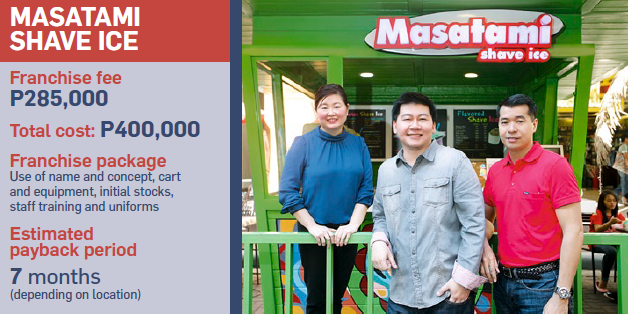 Co and business partners Emerson O. Lim, Joel Jay Tuquib, and Eliseo V. Alcantara III pooled P2 million as starting capital to put up Masatami Shave Ice. More than the money, however, the business partners consider their know-how in the food business their most important asset. In all their food ventures, Co and her partners appeal to the “child in everyone.” “Children are fond of eating anything cold and delicious. Masatami Shave Ice is inspired to bring out this child in everyone through sophisticated yet intriguing flavored ice blocks served as shaved ice,” she says. This dessert is made from ice finely shaved into a consistency slightly denser than frost, then mixed with flavored syrup. 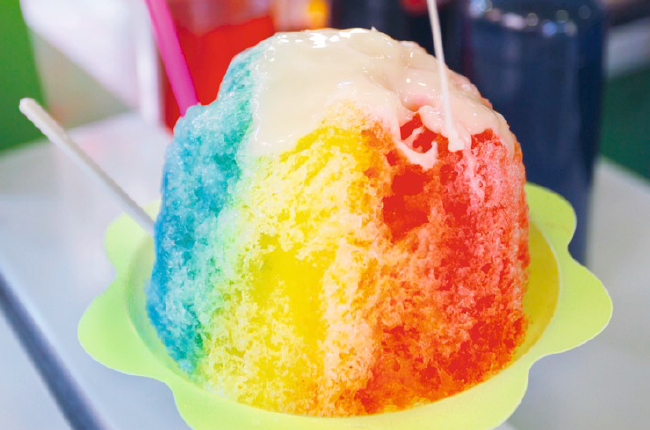 Masatami Shave Ice uses the latest technology in shaving the ice blocks and uses toppings like fresh fruits. As a franchise concept, Masatami Shave Ice’s unique offering and wide market reach make it an easy favorite. “We target families, kids, and young professionals. These products are all well thought of and we only use fresh ingredients for our flavored ice blocks. We also carry sugar-free and liquor-based syrups,” Co says. The brand name, booth design, packaging, taste profile, and product lineup set Masatami Shave Ice apart from other players in the industry, too. “We have quality products at very affordable prices. We use colorful cups to draw attention. We don’t spend big for marketing. We believe that word of mouth is still a very powerful tool,” she says. Social media sites such as Facebook, Twitter, and Instagram have been helpful in spreading the word online. This article was originally published in the March 2013 issue of Entrepreneur magazine and was recently updated by the online editor. Subscribe to the print or digital version here.